I'm so glad this is in my neighborhood but I don't know if I would have ever noticed it if a friend who knows the owner hadn't mentioned it because it's in a tiny unassuming former men's wear storefront with not much signage. However once you get in the entrance way you know it's a spice store because of the pleasant aroma of cinnamon that lingers there for some reason. It's a tiny store, but owner Steven Tobiasson, a veteran of the spice trade, stocks a large selection and if you don't see it in the front he probably has it in the back. For example I needed some dried peppers and didn't see any, but ended up leaving the store with five different kinds from guajillo to japones. He even gave me some ghost peppers to sample, with ample warning on how to handle them properly. I also was happy to sample the incredible high-grade sansho, a tingly highly-aromatic relative of the more well-known sichuan pepper. He makes a few spice blends in house and I sampled a few even though I usually make my own and ended up purchasing the excellent Za'atar and the mulling spice blend. The shichimi togarashi made with the sansho was also pretty tempting, but at that point I'd already filled my shopping bag. The prices here are excellent so it was hard not to buy everything- jars were from 2-4 dollars for most spices and packages 1-7 depending on the spice of course. 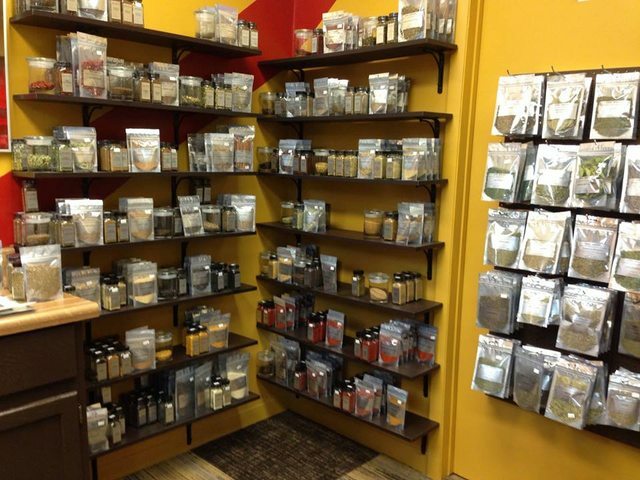 Other great finds included whole spices of all kinds, long pepper, and dehydrated kafir lime leaves. I definitely recommend checking this place out. I manage the library just down the street from this store. We asked him to do some programs here and he very kindly agreed. Last Wednesday, he did a program on pie spices, and on December 17th he will be doing one on mulling spices. We keep the programs small to allow for attendee participation. And, they make the library smell wonderful. He's a great addition to the neighborhood. I hopped off the Chicago bus on the way home last Tuesday to pick up allspice berries and juniper berries in preparation for Thanksgiving. I called in advance to confirm they had what I needed. He even gave me the prices over the phone, which were very competitively priced. I loved the selection, the prices, and location. I will definitely be a regular and hope they do well. 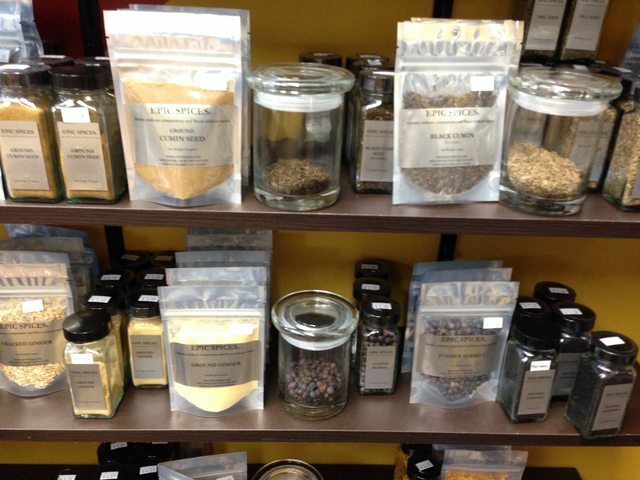 Steve has started a section for making bitters- it has a variety of common and uncommon items like quassia and wormwood. I just started making bitters and I'm excited about checking it out. I'm really excited about this spot - a new discovery for me despite it being effectively in my neighborhood (I live less than a mile away). I stopped by for the first time earlier this week, and I can only say it's a little like foodie heaven. I went in specifically for Sichuan peppercorns (a very affordable 1 oz for just over $3), but ended up walking out with 5 other spices as well as a pouch of their Aztec hot cocoa blend, all for about $20. The service was friendly and knowledgeable, and the prices so competitive. I will definitely be back, and hope that these folks get plenty of customers as I want to see this independent business, in my neighborhood and totally in my wheelhouse, survive and thrive! Wonderful spot in the neighborhood - great prices, very friendly. A little easy to miss because it's a smaller space. 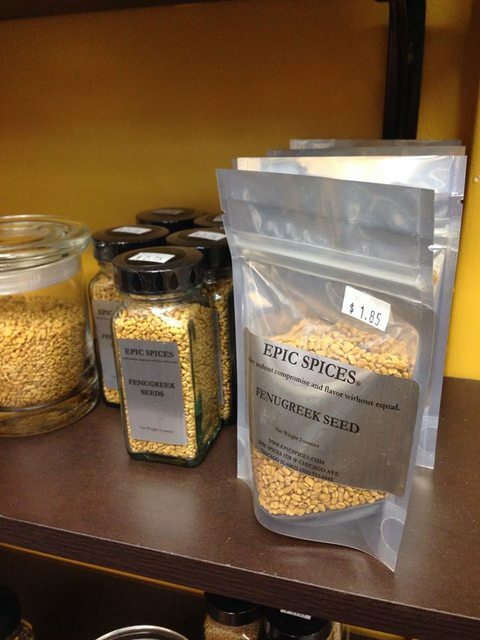 Stopped by for emergency whole nutmeg recently, and noticed they also have their own berbere blend, which I'd love to buy and try the next time. Glad this popped back up as I have been a somewhat regular visitor for a long time and am always impressed with what they have and the prices for the little shop that it is. For Christmas I gifted an entire Indian Spice Cabinet and Steve took excellent care of me and had a couple of things I asked for that were not displayed. Also, used his beef roast blend and had good reviews from the family. Glad to have them in the neighborhood / Chicago! I used to live two blocks due north of Epic Spices, and going there every weekend is probably the thing I miss most about Chicago. My bitters and vermouth game changed dramatically when Steven started bringing those high quality and crazy cheap herbs in, and he'll happily order weird one-offs, like the raft of kombu he acquired for me, if you intend to buy it all. Going there really was a joy, both for the absurd quantity, variety and quality of spices and the time spent with Steven and Natalie. I make a point to stop in whenever I'm back in town. Sprinkle Maldon sea salt and fennel pollen over a healthy dollop of raw honey alongside freeze-fried satsuma oranges and some thinly-sliced soppressata. Serve with an orange wine, like Vodopivec Classica, and accept the praise your guests hurl at you with self-deprecating grace and class. syncretism wrote: I used to live two blocks due north of Epic Spices, and going there every weekend is probably the thing I miss most about Chicago. My bitters and vermouth game changed dramatically when Steven started bringing those high quality and crazy cheap herbs in, and he'll happily order weird one-offs, like the raft of kombu he acquired for me, if you intend to buy it all. Going there really was a joy, both for the absurd quantity, variety and quality of spices and the time spent with Steven and Natalie. I make a point to stop in whenever I'm back in town. Hey there Syncretism! Was wondering what happened to you--sorry you won't be joining us at Soup & Bread this year! Hope you're enjoying wherever you are. Great rec on the charcuterie combo above--I'll have to try that! I am so glad to have found this fabulous resource in our neighborhood. Great quality, good prices, super friendly service. Have been a loyal Spice House for 30 years, but now I don't have to deal with the Old Town parking situation. Continue to love being able to pop in frequently. Stephen and his wife (I have to ask for her name) just couldn't be friendlier or more helpful. Prices and quality are awesome. First stop in today, won't be my last - very nice shop, and had exactly what I was looking for, plus a few things I didn't know I needed.